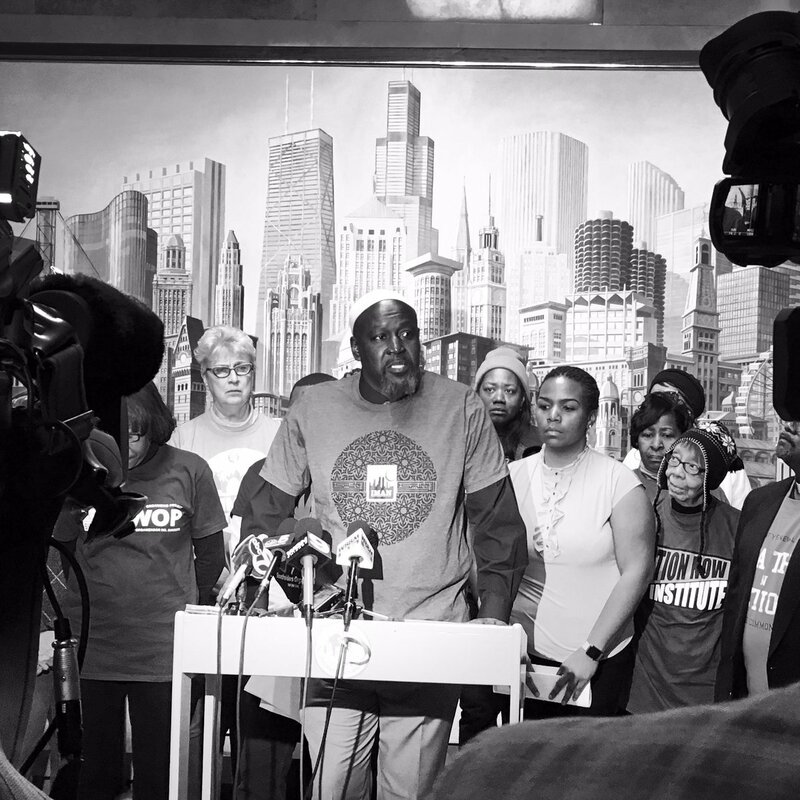 On March 22, IMAN joined fellow members of the Grassroots Alliance for Police Accountability (GAPA) for a press conference at City Hall announcing the release of their Citywide Community Conversations report. Veteran organizers from across Chicago gave testimonials stressing the urgency of this police accountability campaign, and called on city leadership to act now to support community-driven changes to police protocol. Green ReEntry leader Mustafa Hawthorne spoke powerfully about his experience with the Chicago Police Department and the Illinois correctional system, a story which traces its roots to the era of the infamous commander Jon Burge. Along with other local organizers, the press conference shed light on the devastating harm that police misconduct can have on the individual, family and community levels. 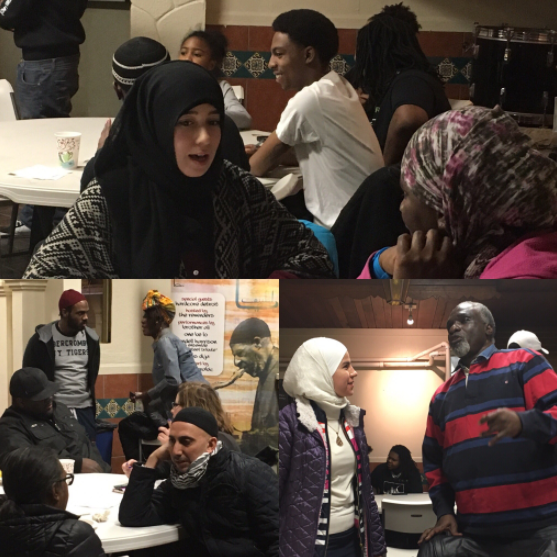 IMAN’s efforts with GAPA will continue, as community voices are lifted up and city leadership is engaged in pursuit of lasting change to the status quo. Police accountability is an issue affecting many IMAN leaders, for whom GAPA serves as a promising vehicle through which to counteract the over-criminalization of Black and Brown communities. If you are interested in joining this campaign, contact Organizing Director Shamar Hemphill at shamar@imancentral.org. 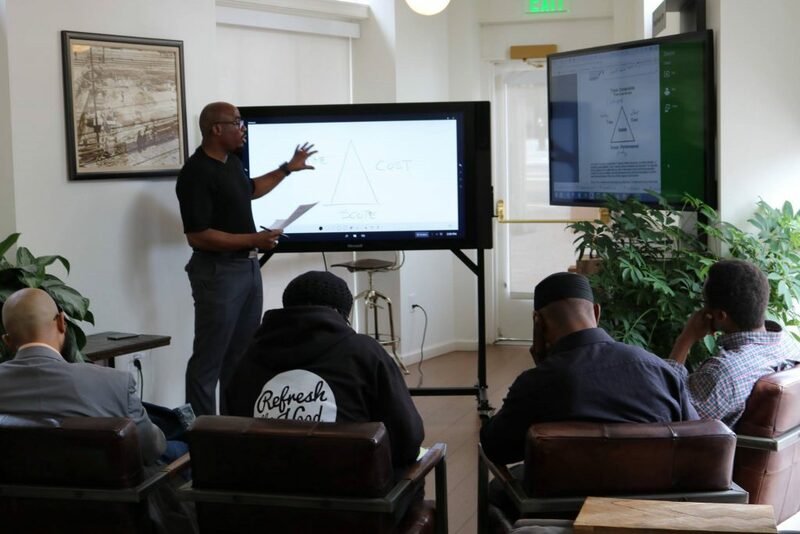 Along the way toward transforming its first construction project into what will be IMAN ATL’s new headquarters, the Atlanta Green ReEntry cohort enriched their program experience through career development workshops and weekly gatherings dedicated to spiritual nourishment. In keeping with Green ReEntry’s core values of financial stability and empowerment, the cohort attended trainings at Tarchitects LLC, an established architecture firm in the heart of Atlanta. The brothers participated in daylong sessions focused on the ins and outs of project management, learning best practices regarding budgeting, proposal developments and collaboration strategies. This past year’s long days of work and study were balanced with weekly gatherings geared toward spiritual growth. Following Saturday morning prayers, the Green ReEntry brothers joined fellow community members to reflect upon reminders of the importance of embodying genuine, noble character traits. Breakfast and continued conversation follow each weekend’s sitting. 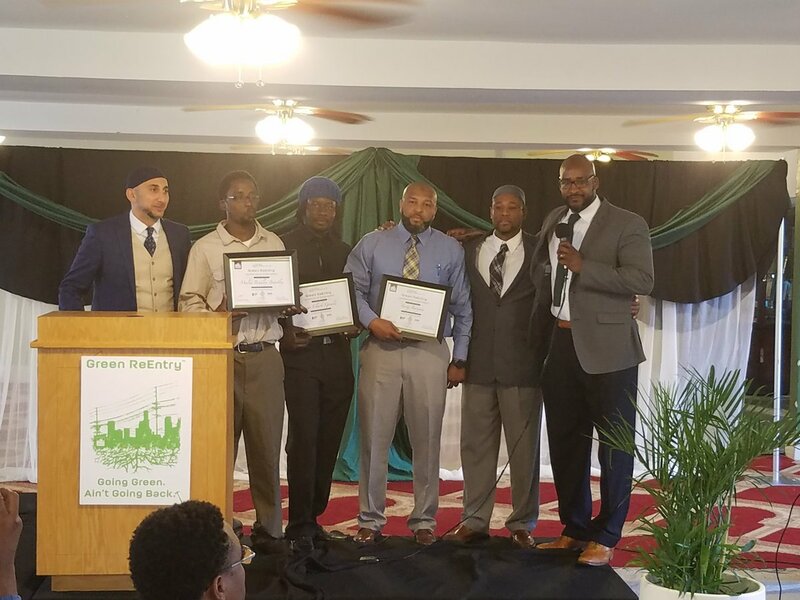 On May 21, IMAN staff, Advisory Board members, and supporters from the larger Atlanta community gathered to celebrate the accomplishments of this first Green ReEntry cohort as they graduated from the program. Their hard work has laid a sturdy foundation for future participants returning home to beautify their communities and realize success in their individual lives. Be sure to follow IMAN Atlanta on Facebook for the latest news and updates, and keep the entire Green ReEntry cohort in your prayers as they continue to change, serve and inspire! IMAN leaders Markus Harris and Cedric Smith recently stepped into roles as Health & Wellness Advocates, working full time at the intersection of our community organizing and farmers’ market work. 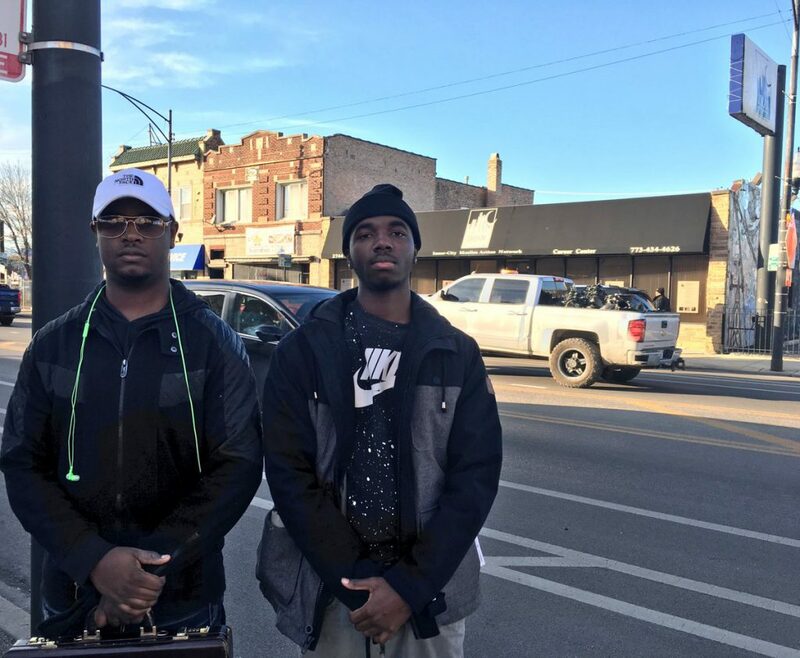 We sat down with both young men, longtime Marquette Park residents, to discuss their experiences on staff. How did you become Health & Wellness Advocates? M: We were hired after completing [IMAN community partner] St. Sabina’s Community Youth Employment Program, which was a very impactful experience. We learned how important your character is in the workplace. First impressions matter, it’s cliché but it really does matter. So really beginning to incorporate that knowledge into my outlook and my actions will help me succeed at IMAN, and in my future professional life. In the past, we were both connected to IMAN as leaders, so to be hired through this program just brings things full circle. C: I look at my prior volunteer experience at IMAN as what really helped jump-start this job opportunity. I was able to establish relationships with staff and other leaders by way of this, and that made things much smoother when I transitioned to this paid position. My past work experience taught me a lot of what the St. Sabina training offered, but I definitely improved my interpersonal skills through their program. I communicate and express my thoughts and feelings in more effective ways. I’ve applied that at IMAN and I’m seeing the benefits now. How have the past few months been working at IMAN full-time? What projects did you work on? M: The Muslim Run Corner Store Campaign, and the Farmers’ Market have been the main work. As Health & Wellness Advocates, our main focus is increasing community access to healthy food options and spreading awareness about the importance of overall wellness. Right now, I’m working on how to market the Corner Store Campaign more effectively at the local level, mostly through social media. I’m working to engage more young people in the campaign. I’ve also helped support various events as a volunteer, like the monthly Senior Wellness Luncheon. 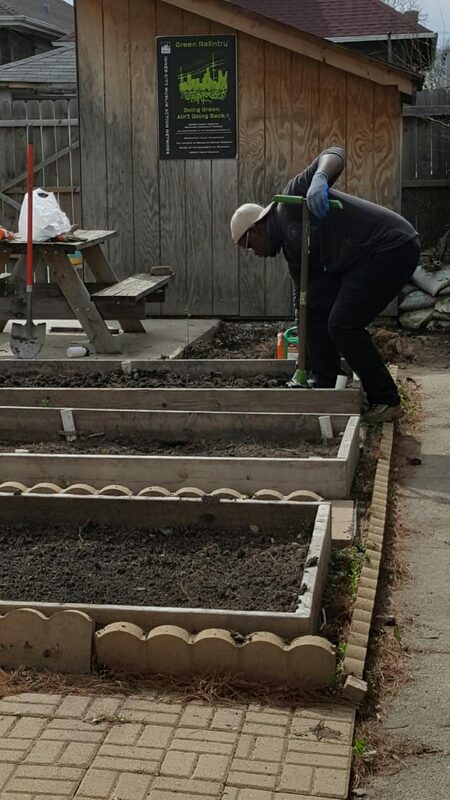 C: We also helped reestablish the backyard garden at the Green ReEntry house on Fairfield Avenue. Cedric, you recently started volunteering at IMAN and very quickly assumed this position as a Health & Wellness Advocate. How was your experience transitioning into this deeper role and working full-time? C: Well a paycheck is a big difference between my volunteer experience and what I’m doing now [laughs]. This experience really helped me better prioritize my time and my energy in all aspects of my life. I spent the majority of my week at IMAN of course, but I also have a life outside of IMAN. So managing my time and being productive at work has shown me the benefits of taking advantage of my time in a general way. Also I’ve had great opportunities to see the city and get introduced to different communities. I traveled with Rami when he’s spoken at different universities, I met leaders at other community organizations, I went to City Hall for press conferences. All that has resulted in a lot of personal development for me, experiencing these spaces. Why is your work so important to you? M: The Health & Wellness Advocate’s title speaks for itself. Trying your best to influence your community to live in a more healthy and beneficial way. It’s about setting a good example and encouraging those around you to try their best to do the same. C: I believe in the idea of change. Positive change is something that this community desperately needs, and that’s including my own self as well. So bringing about change is what motivates me to do this work, and I’m proud to be able to do that.